It's not quite clear what he meant, but it didn't go over very well. 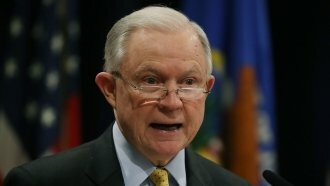 Attorney General Jeff Sessions referred to the role of sheriffs as part of "Anglo-American heritage" in a speech to law enforcement officials on Monday. He said: "I want to thank every sheriff in America. Since our founding, the independently elected sheriff has been the people's protector," and "The office of sheriff is a critical part of the Anglo-American heritage of law enforcement." Sessions seems to have made the comments on the fly. According to a written version of the speech, he was supposed to say, "The sheriff is a critical part of our legal heritage." He also cut out a reference to tribal law enforcement that appeared in his prepared remarks. Monday's comments didn't go over too well given the fact Sessions has been accused of racism in the past. In 1986, his nomination for a federal judgeship was rejected due to accusations of racism. Some of those accusations came from civil rights leader Coretta Scott King, who said in a letter that Sessions had used his position as a U.S. attorney to intimidate black voters in Alabama. However, some legal experts have speculated Sessions' statement Monday was referring to the shared common legal heritage of England and the U.S. sheriffs' systems.